I’ve just noticed that Safari 4 has an image cache for every web page I visit (~/Library/Caches/com.apple.Safari/Webpage Previews). Safari stores a jpeg and png version of every web page visited. Is there anyway to turn this feature off? What, you mean you don’t take full advantage of Safari 4’s Top Sites feature? The eye-tastic feature that displays websites you've visited on an image wall? Me neither. Oh, you do? In that case you want the images in this folder because they appear on this wall. Oh, you don’t? Fair enough. I just glanced at my folder full of images and it consumed just under 250MB of storage. Nothing, really, in these days of terabyte drives, but if you’re particularly parsimonious with your storage, I can understand not wanting the extra burden. Lock the Webpage Previews folder to keep from accumulating previews. Safari’s Empty Cache command won’t dispose of them. Instead, just open that Webpage Previews folder using the path you indicated and toss out its contents. 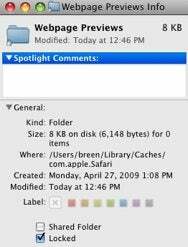 Then back up one level, highlight the folder, and press Command-I. In the resulting Info window enable the Locked option. With the folder locked Safari will find it impossible to save images to it.